As her event team began planning their company’s biggest conference of the year, Heidi Lorenzen was looking for a way to differentiate their event from others. “We have always been good at attendee acquisition, but this year we needed to reach out to new audiences and wanted to drive higher attendance as well,” she said. To make this idea a reality, Lorenzen’s organization turned to podcasting. As a result, attendance went up, and the audience mix moved in the right direction. No matter where you are in the events industry, you’re probably familiar with this conundrum: How do you differentiate yourself from competing events and create enough excitement around it to inspire people to take time out of their busy schedules and/or spend the money to attend? While most individuals tasked with driving attendee traffic use traditional techniques, doing the same thing as everybody else makes you look like… everybody else. In marketing terms, that means you’re “functionally equivalent.” Not exactly a selling point that will get attendees to your show. This is where a great podcast can make a difference. Chances are, you’ve already heard about podcasting. For many, it’s simply something teenagers listen to on their iPods. Others think that without an iPod, there can be no podcast. Both assumptions are wrong — and believing them will lead you to miss an opportunity to reach out to your audience in a way that humanizes your conference and generates interest in your content. For those not familiar with podcasting, a definition: A podcast is an audio or video file that has been recorded and placed on the Internet to be enjoyed at the listener’s convenience. 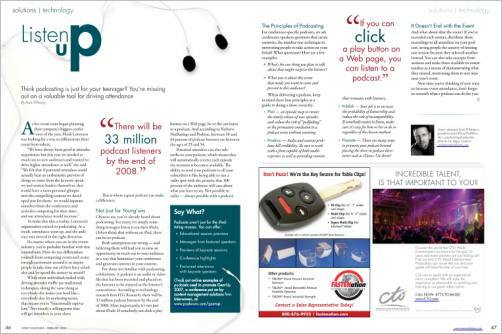 According to technology research firm ITG Research, there will be 33 million podcast listeners by the end of 2008. More importantly, it’s not just about iPods: If somebody can click a play button on a Web page, he or she can listen to a podcast. And according to Neilsen/ NetRatings and Podtrac, between 58 and 64 percent of podcast listeners are between the ages of 25 and 54. Potential attendees can also subscribe to your podcast, which means they will automatically receive each episode the moment it becomes available. The ability to send your podcasts to all your subscribers is like being able to run a radio spot with the promise that 100 percent of the audience will care about what you have to say. Not possible in radio — always possible with a podcast. * What’s the one thing you plan to talk about that might surprise the listener? * What was it about this event that made you want to come and present to this audience? * Publish — Your job is to increase the probability of listenership and reduce the risk of incompatibility. If somebody wants to listen, make sure it’s easy for him or her to do so regardless of the chosen method. * Promote — There are many ways to promote your podcast beyond placing the show in podcast directories such as iTunes. Use them! And what about after the event? If you’ve recorded each session, distribute those recordings to all attendees via your podcast, saving people the anxiety of missing one session because they selected another instead. You can also take excerpts from sessions and make them available to nonattendees as a means of demonstrating what they missed, motivating them to not miss next year’s event. Next time you’re thinking of new ways to increase event attendance, don’t forget to research what a podcast can do for you. Guest columnist Scott Whitney is president and CEO of PodWorx Inc., a podcasting production firm in Las Vegas.